Each year, Mayo Clinic cares for more than 1 million patients from the U.S. and more than 143 countries worldwide, including many Spanish speakers. 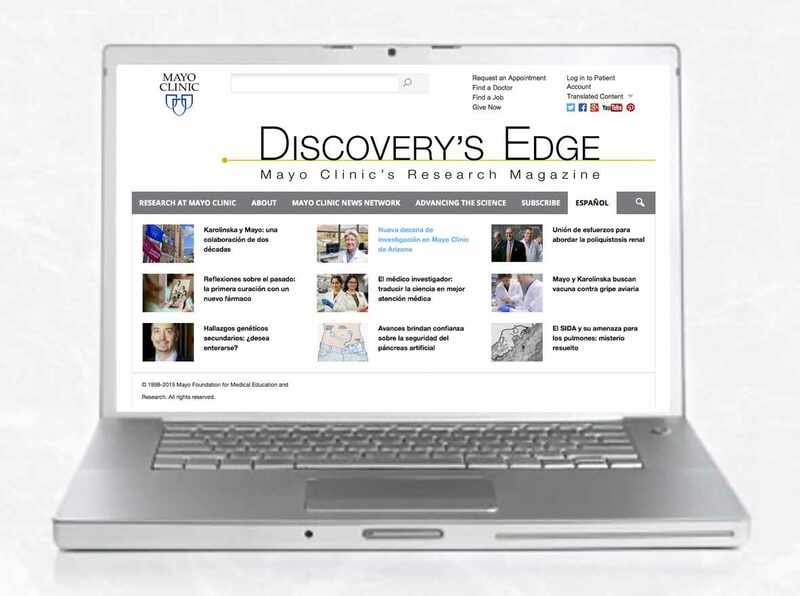 To better serve these patients and everyone interested in Mayo’s research, Mayo Clinic has launched its new Discovery’s Edge online version in Spanish. Discovery’s Edge offers insight into the process and progress of medical science discoveries at the world’s-largest group medical practice. The magazine’s mission is to tell the stories of scientists and physician-researchers who are improving treatment and care for patients every day through interdisciplinary studies in all areas of medicine. The magazine’s newest online presence was launched in January 2016, greatly expanding the number of news and feature articles, as well as adding videos and animations. Mayo Clinic has more than 1,000 medical researchers and an annual budget of more than $660 million dedicated to making discoveries that will help meet unmet patient needs. Mayo investigators share their discoveries and other scientific knowledge by publishing more than 7,000 journal articles annually and presenting at medical conferences worldwide. Discovery’s Edge conveys those findings to the public in terms they can understand, with visuals that captivate. The news media may republish articles with permission.